The Aquascape Stacked Slate Spillway Wall 32" Landscape Fountain Kit makes it easy to add the relaxing sights and sounds of water to any location. 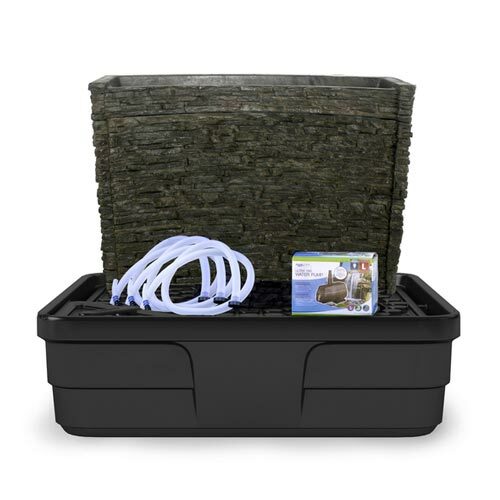 This complete kit comes ready to install with an included Ultra 2000 Water Pump and AquaBasin 45 sub-surface reservoir. Water surges through three separate water outlets at the top of the 32" tall wall before spilling over the textured front of the feature. The impressive natural-looking finish looks and ages like real stone, and the durable, lightweight fiberglass-resin composite construction is built to last. Three sections of fountain tubing are provided to supply each water outlet. The Stacked Slate Spillway Wall comes in two parts for easy transport. Simply assemble the fountain by setting the top section onto the bottom section.